Home > Services > Total Shoulder Replacement. The typical total shoulder replacement involves replacing the arthritic joint surfaces with a highly polished metal ball attached to a stem, and a plastic socket. A total shoulder joint replacement. Total Shoulder Replacement. 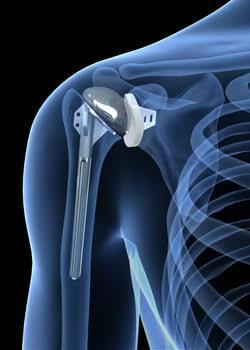 The typical total shoulder replacement involves replacing the arthritic joint surfaces with a highly polished metal ball attached to a stem, and a plastic socket. A total shoulder joint replacement.